I am really happy that I found the Annmarie Skin Care products because the ingredients are 100% natural. I love that fact because I believe my skin deserves the best. I had oily skin, especially in the T-zone area. I started purchasing skin care products from other expensive brands, looking for a product that would help me, but I didn’t see any results. Also, I was concerned because I noticed the appearance of fine lines around my eyes. Louise Hay recommended Annmarie Skin Care, and I immediately bought the samples for oily skin. When I put the serum and moisturizer on my face, it was like my skin was thirsty— it felt so good! I used the Aloe-Herb Cleanser (the smell is a luxury) and continued with the Purifying Mud Mask. I also love the Citrus Mint Facial Cleanser (the lemon smell is divine for me). The Neroli Toning Mist was refreshing. Next I used The Citrus Stem Cell Serum (my skin absorbed it very quickly). In my T area, I applied Herbal Facial Oil for Oily Skin, and for the rest of my face and neck I used Herbal Facial Oil for Normal and Combination Skin. A few days after I got my samples, I was totally in love with them, so I purchased the Anti-Aging Eye Cream and more products from Annmarie. I apply Annmarie Skin Care products every day, twice a day (in the morning and before I go to sleep). I will continue purchasing these products because the results are amazing, I love my skin, the appearance of dark color and fine lines around my eyes is better, and I feel like a queen. Before I used Annmarie Skin Care, I was wearing liquid foundation. 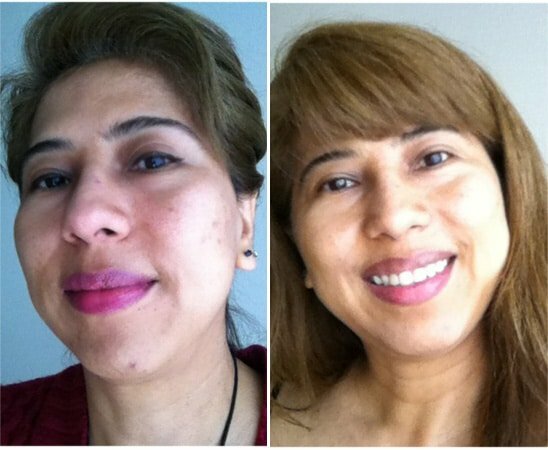 Now, my face looks so healthy that I do not want to wear make-up — I do not need to cover anything! If I have to wear make-up, I use one drop of foundation and mix it with a lot of Sun Love. This works excellent on my face, and I know that I am protected from the UV sunlight. I believe if I continue using Annmarie Skin Care I will continue looking good and feeling amazing inside and out every day, and I love that. Thank you, Annmarie.